Quite a while ago I asked my readers whether they want me to post recipes using beets and they answered yes. 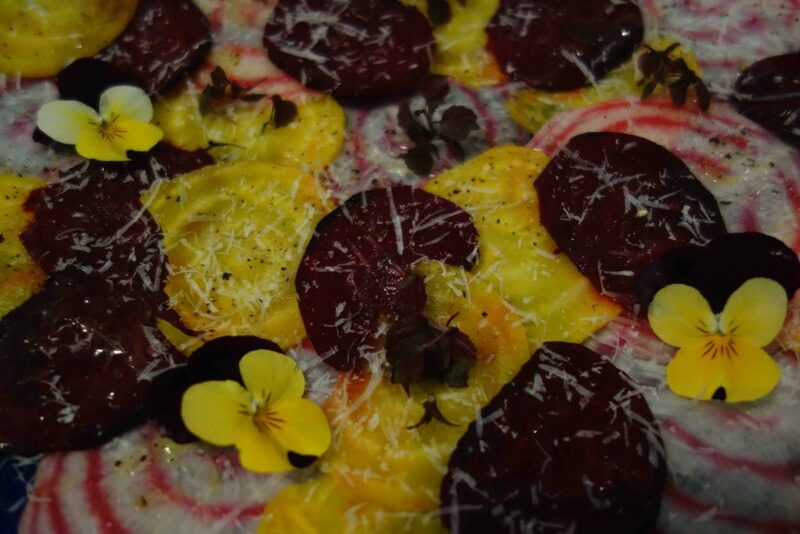 So today we are starting with a really beautiful beet carpaccio. Before doing this carpaccio, I didn’t know that beet can actually be eaten raw, but as you all know: we never stop learning 🙂 The carpaccio is really quick and easy to make, but I would definitely recommend to wear disposable gloves. Otherwise you would end up with colored hands and we don’t want that. So, let’s move on to the recipe! First you have to peel the beets. Start with the white one as this beet colors the least. Then continue with the yellow one and finish with the red one. Nevertheless I would recommend wearing your gloves from the beginning, because the yellow beet also tends to color your fingers. Go on by cutting the beets into really thin slices using a mandoline. Next you put your slices either on 2 to 3 big plates or on 6 smaller plates. Now you season your carpaccios with a bit of salt and some freshly ground pepper. After that you drizzle a generous amount of high-quality olive oil on top and add some freshly grated parmesan. To finish your plates just add some edible flowers and a bit of cress and you are ready to serve your vegetarian carpaccio! When it comes to the cress, don’t hesitate to experiment. There are a lot of varieties- especially from Asia. I personally like the wasabi cress which adds some spiciness and really nice flavor to this dish. Just ask your greengrocer or go to a farmers’ market to find something special.